▪ Set up performance options for the 3 sections [Main Mixing, Main Output Strobe, Virtual DMX Universes] as explained below. MADRIX includes effect generators and graphics render engines. Rendering is done in FPS [Frames Per Second]. ▪ FPS - Defines the frame rate of the Main Mixing, the high-level render process. Normally you do not need to change this setting. R - Restores the default settings. The default value is 50.0 FPS. ▪ Only change this value if it is really necessary! ▪ Hz - Defines the frequency of the Main Output Strobe. R - Restores the default settings. The default value is 16.7 Hz. Output And Black - Strobes between the regular output and the color black. The strobe color you have chosen will be ignored. Choose this mode if you want to make sure that the output itself is strobed. Black And Strobe Color - Strobes only between the color black and the strobe color you have chosen. The output will be ignored. Chose this mode if you want to achieve a pure strobe that is independent of the output and will always be clearly visible. 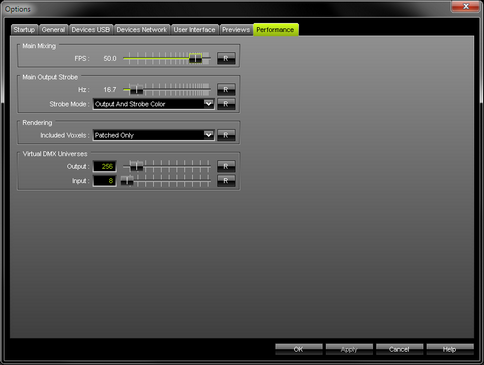 This performance setting refers to the overall rendering process in MADRIX. R - Restores the default settings. The default value is Patched Only. ▪ Output - Defines the number of virtual universes which MADRIX can address. - Change this value if you need to use more virtual universes than actual DMX universes in your Patch. - It is possible to use more virtual DMX universes than actual DMX universes by using less than 512 DMX channels per universe. - The maximum value is 2048. R - Restores the default settings. The default value is 256 DMX universes. ▪ If you are expanding your MADRIX product license, make sure to set up the correct Output values. ▪ Please remember that your MADRIX KEY [MADRIX product] limits the number of actual DMX universes available for output. ▪ Input - Defines the number of universes which MADRIX can use for input [Preferences > Device Manager... > DMX Input]. R - Restores the default settings. The default value is 8 DMX Input universes. ▪ Please restart the MADRIX Software if you have changed any settings. ▪ All options of Performance will be saved locally on your computer. The settings described in this topic will not be saved in your MADRIX Setup file.